North African Eggplant Tagine Fill 1 Created with Sketch. 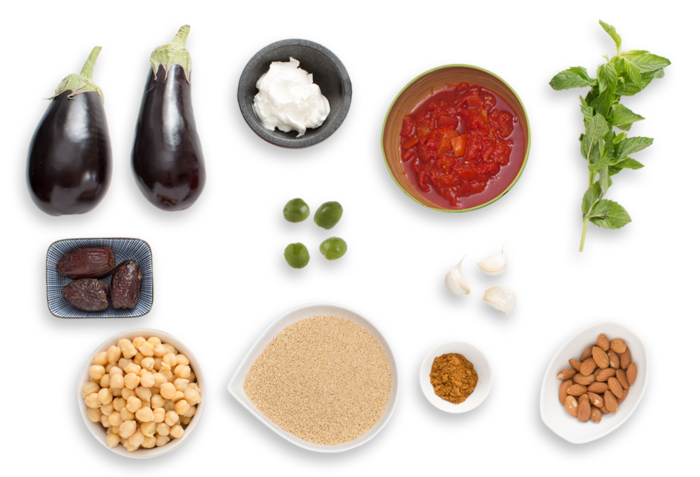 Tagine is a Berber stew named for the wide, cone-topped, earthenware pot in which it is traditionally simmered over a bed of coals. In this recipe, we’re bringing the dish into your kitchen and cooking tagine over the stove. 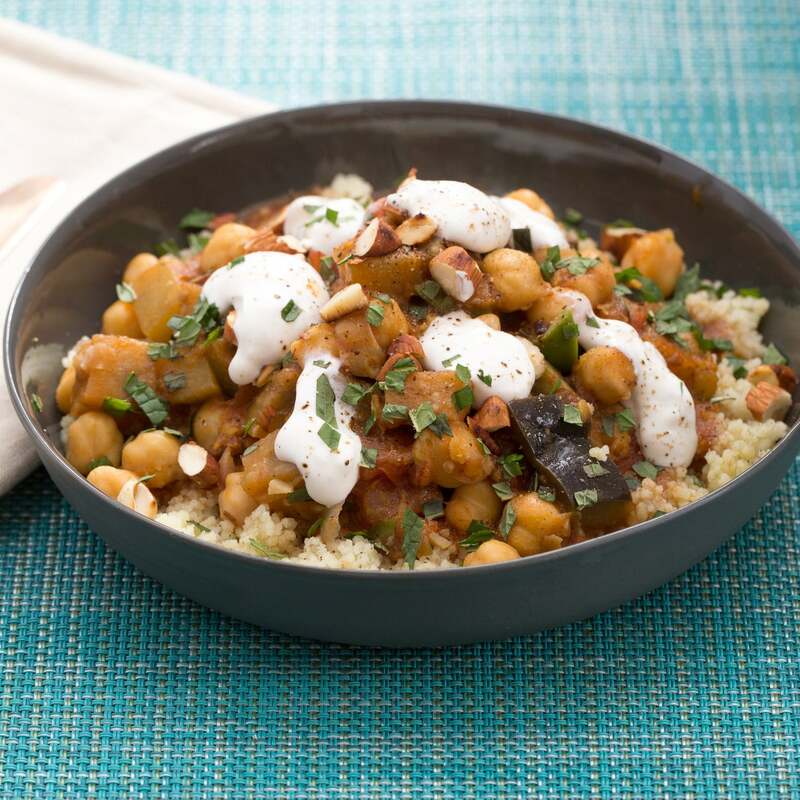 Made with chickpeas, Medjool dates, mint and Holland eggplant—an especially lush and tender variety that’s perfect for stews—this spiced, balanced dish is bursting with the flavors of North Africa. Wash and dry the fresh produce. Peel and mince the garlic. Pit and roughly chop the dates. Roughly chop the almonds. Drain and rinse the chickpeas. Pick the mint leaves off the stems; discard the stems. Using the side of your knife, smash the olives; remove and discard the pits. Roughly chop the olives. Medium dice the eggplants. In a small pot, heat 1¼ cups of water and a big pinch of salt to boiling on high. Once boiling, stir in the couscous and remove from heat. Cover and let stand 4 to 6 minutes, or until the water is absorbed and the couscous is tender. Stir in a drizzle of olive oil and season with salt and pepper to taste. 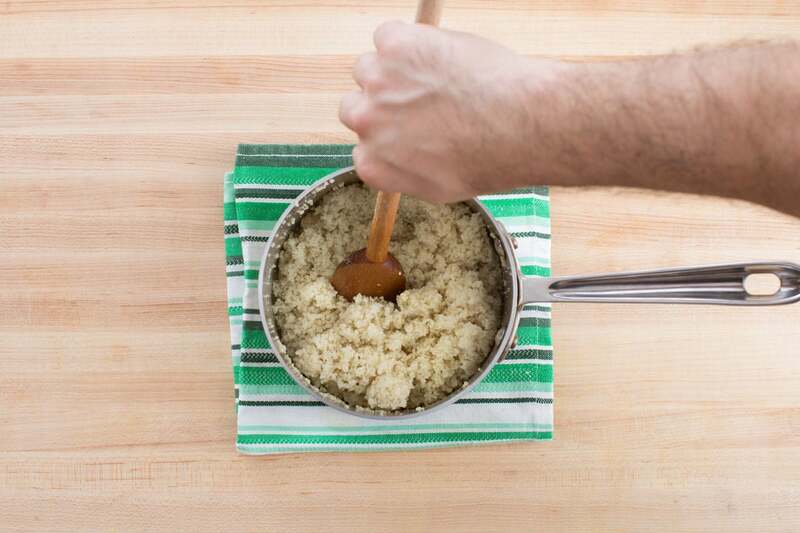 While the couscous cooks, in a medium pot, heat 2 teaspoons of olive oil on medium-high until hot. Add the garlic and ras el hanout; season with salt and pepper. 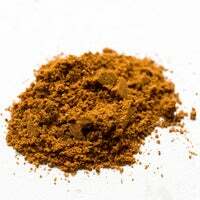 Cook, stirring frequently, 1 to 2 minutes, or until the garlic is softened and the ras el hanout is toasted and fragrant. Add the diced tomatoes; season with salt and pepper. Cook, stirring occasionally, 3 to 5 minutes, or until slightly reduced in volume. Add the chickpeas, eggplants, dates, olives and ½ cup of water; season with salt and pepper. Bring the mixture to a boil. Once boiling, cover and reduce the heat to medium; cook, stirring occasionally, 4 to 6 minutes, or until the eggplant has softened slightly. 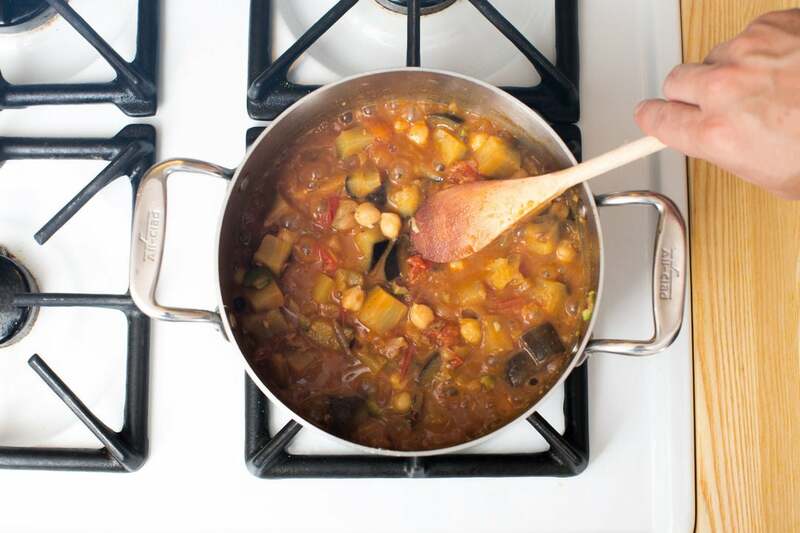 Uncover and cook, stirring occasionally, 6 to 8 minutes, or until the eggplant is completely softened. 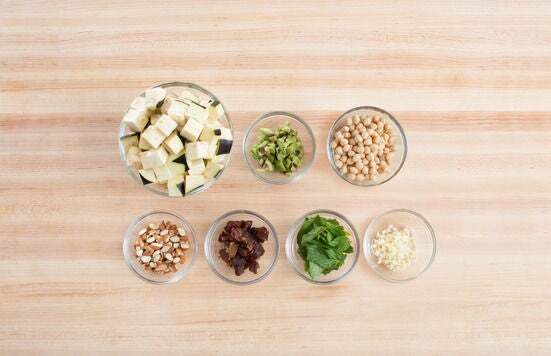 Season with salt and pepper to taste and remove from heat. 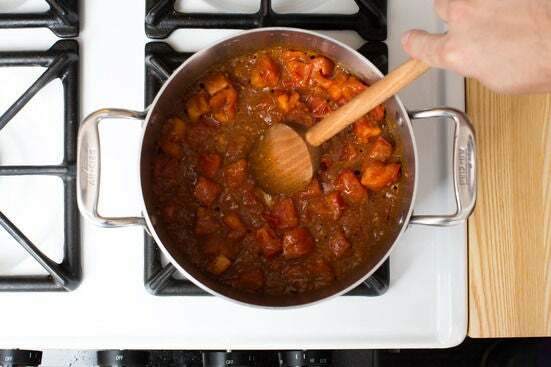 While the tagine cooks, heat a small, dry pan on medium-high until hot. 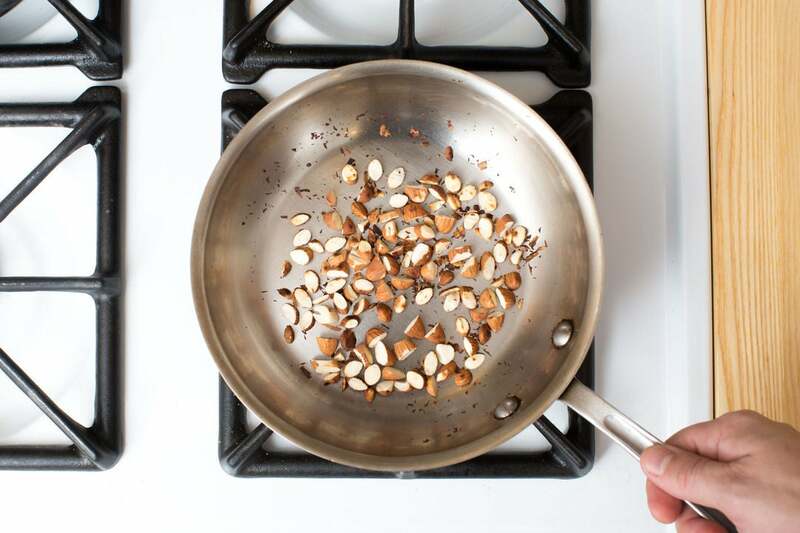 Add the almonds and toast, stirring frequently, 2 to 4 minutes, or until fragrant. Transfer to a small bowl. 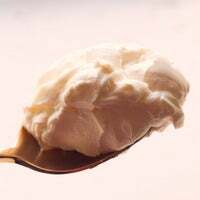 In a small bowl, combine the labneh with a splash of water; season with salt and pepper to taste. 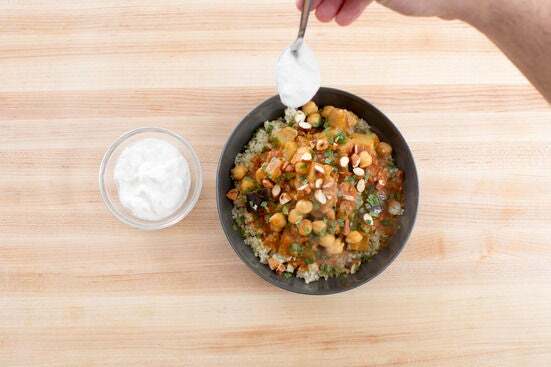 To plate your dish, divide the couscous and tagine between 2 dishes. Garnish with the toasted almonds, seasoned labneh and mint (roughly chopping the leaves just before adding). Enjoy!